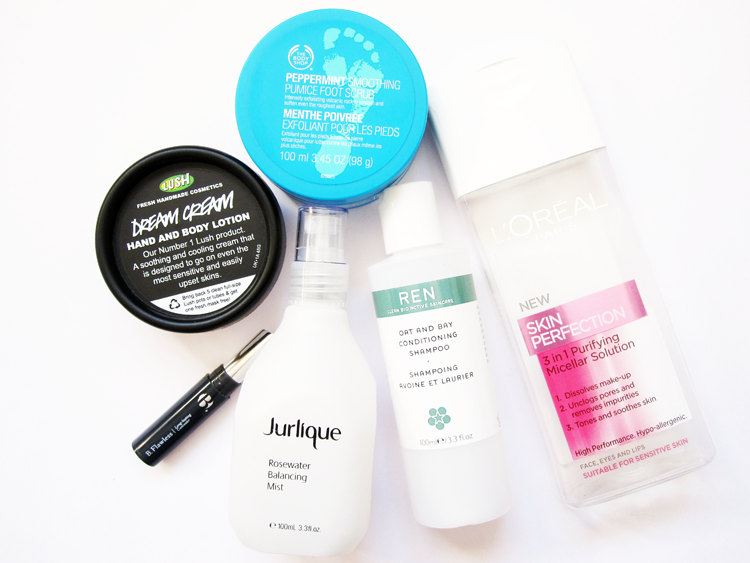 Here are my June Empties! Quite a good mix of products that I've managed to use up, so these are my final thoughts on them and whether I'll be repurchasing any again or not. Took this little tub on holiday with me recently and it was fab as an all over body moisturiser and as a hand cream. Light in texture but very hydrating and great for dry skin. Gone through so many of these! Repurchase? Yes. An essential for when I do pedis at home; it has a weird jelly like texture but is packed full of finely ground pumice which makes it a brilliant foot scrub. I also love the intensely fresh peppermint scent it has too. Repurchase? Yes. I did it, I finally finished a makeup product! This is one of my favourite budget friendly concealer sticks; gives a good level of coverage, is easy to blend and lives up to its long lasting claim. Repurchase? Will do once I've used some other concealers up. I think this may be my third or even fourth bottle, either way it's safe to say that this is a firm skincare favourite of mine. Very refreshing and soothing on the skin, plus it helps to get rid of any redness as well and lasts ages. Repurchase? I'm using the Conscious Skincare Chamomile Hydrolat at the mo, but I'm sure I'll be picking this up again in the near future. I've had this in my travel bag for a while so used it up on holiday. It's a very gentle, SLS free shampoo so kind to sensitive scalps and it doesn't dry my hair out. A good natural option to try. Repurchase? Yes. I've used one of these before and I picked it up again when it was half price in Boots because I'd run out of my beloved Bioderma. I use it for removing the bulk of my makeup before doing a double cleanse and it gets the job done, but I hate the annoying flip top as it has a tendency to go everywhere. Repurchase? No, as I've repurchased the B. Pure Micellar Water instead. I’m always getting through cleansing water. I’ve recently used up the Simple cleansing water and I don’t rate it above others I have tried. I've tried the Simple one too and didn't like it much, there are definitely better ones out there. The B. Pure one I'm using at the moment is fab! I've never heard of Dream Cream before, I'm going to check this out best time I go to a LUSH store. The peppermint scrub sounds lovely, I love the smell of peppermint.